Daily prayers are said on a regular schedule at Saint James. On Wednesday evenings, we invite you to explore and celebrate the inspiring lives of the saints at our Evening Prayer service. 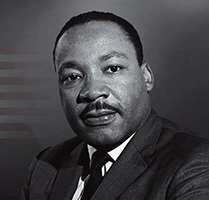 This week we give thanks for Martin Luther King, Jr., born on January 15, 1929, in Atlanta. As the son and grandson of Baptist preachers, he was steeped in the black church tradition. To this heritage he added a thorough academic preparation, earning the degrees of B.A., B.D., and Ph.D. in Systematic Theology from Boston University. In 1954, King became pastor of a church in Montgomery, Alabama. culminated in December, 1955, in the arrest of Rosa Parks for refusing to give up her seat to a white man. King was catapulted into national prominence as the leader of the Montgomery bus boycott. He became increasingly the articulate prophet, who could not only rally the black masses, but could also move the consciences of whites. the passage of the Civil Rights Acts of 1964, 1965 and 1968. King then turned his attention to economic empowerment of the poor and opposition to the Vietnam War, contending that racism, poverty and militarism were interrelated. After preaching at Washington Cathedral on March 31, 1968, King went to Memphis in support of sanitation workers in their struggle for better wages. There, he proclaimed that he had been “to the mountaintop” and had seen “the Promised Land,” and that he knew that one day he and his people would be “free at last.” On the following day, April 4, he was cut down by an assassin’s bullet.